Gustav MAHLER: Symphony No. 2, “Resurrection” (1888-94). Marius CONSTANT: 24 Préludes pour orchestre (1958). Berthe Montmart (sop), Oralia Dominguez (m-sop), Chœur de la RTF, Orchestre National de la RTF, Leonard Bernstein (cond.). 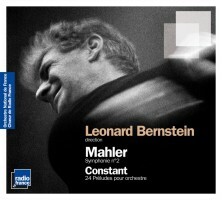 Radio France INA FRF002 (2 CDs) (http://editions.radiofrance.fr/). This wobbly No. 2 wouldn’t make any top-10 Mahler list, but the Twilight Zone composer’s Varèsian vignettes demand far more attention. YES. 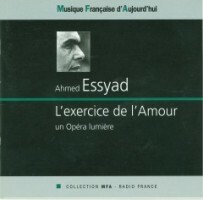 Ahmed ESSYAD: L’exercice de l’Amour (1994-95). Elisabeth Laurence (sop), Sylvie Sulié (m-sop), Gordon Christie (ten), Stephen Richardson (bass), Orchestre Philharmonique de Radio France, Chœur de Radio France, Bruno Ferrandis (cond.). Musique Française d’Aujourd’hui MFA 21610 (1 CD) (http://www.musiquefrancaise.net/). A sincere opera to Bernard Noël’s libretto conveying the transcendental nature of the monastery Chartreuse of Villeneuve-lez-Avignon. MAYBE. Wolfgang Amadeus MOZART: Quintet for two violins, two violas and violoncello in C Major, K. 515 (1787); Quintet for two violins, two violas and violoncello in G Minor, K. 516 (1787). L’Archibudelli: Vera Beths, Lucy van Dael (vln), Jürgen Kussmaul, Gijs Beths (vla), Anner Bylsma (vlc). Sony SK 66 259 (1 CD). 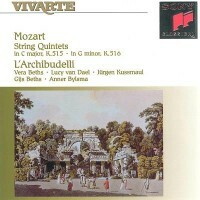 With gut-strings and instruments ideally suited for Rameau, here’s dense, mature Mozart played ultra-Romantically. YES, OF COURSE. 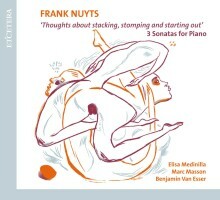 “Thoughts about stacking, stomping and starting out.” Frank NUYTS: Piano Sonata No. 4, “Adde parum parva” (2002, rev. 2006); Piano Sonata No. 5, “Blue rays-Ry’s blues” (2003, rev. 2006); Piano Sonata No. 6, “Outlaw’s exit” (2006). Elisa Medinilla, Marc Masson, Benjamin Van Esser (pno). Etcetera Records KTC 1377 (1 CD) (http://www.etcetera-records.com/). Plumped with mawkish gestures and weak references, three uneven and pretentious sonatas only give postmodernism a bad name. NO, TAKE IT AWAY. Franz SCHUBERT: Divertissement à la hongroise, Op. 54 (1824); Variations on an Original Theme (1824); Fantasie, Op. 103 (1828). 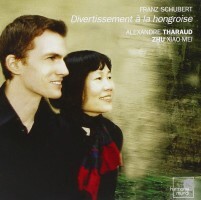 Alexandre Tharaud, Zhu Xiao-Mei (pno). Harmonia Mundi HMC 901773 (1 CD) (http://www.harmoniamundi.com/). Fine renditions of Schubert’s four-hand piano music, however, not as heavenly as playing them oneself even if not as proficiently. MAYBE. 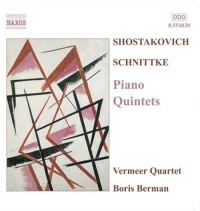 Dmitri SHOSTAKOVICH: Quintet for Piano and Strings, Op. 57 (1940). Alfred SCHNITTKE: Quintet for Piano and String Quartet (1972-75). Boris Berman (pno), Vermeer Quartet. Naxos 8.554380 (1 CD) (http://www.naxos.com/). As powerful a dose of Soviet melancholy as you can imagine, expressed in two five-movement works, in tight and lean performances. YES.